Half hardy, so will tolerate just down to 0C, so give some kind of Winter protection, but are perennial so will flower year after year. Newly released variety, not widely sold or seen in garden centres yet. Sold as 12 plug plants. 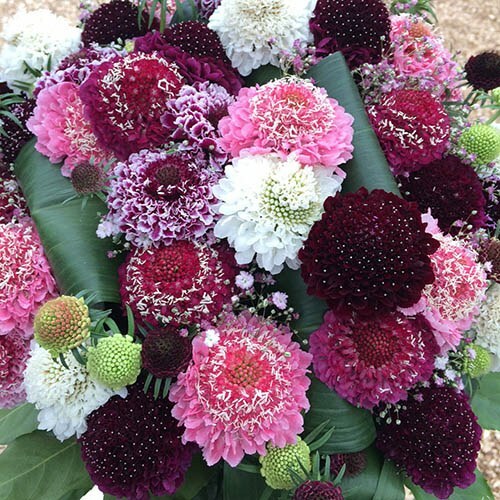 This delicious new series of Scabious has been named 'Scoop' as each large flower head looks like a mouth-watering scoop of fruity ice cream. In shades of white, pale pink, red, berry purple and lavender, they not only look so good that you’ll want to eat them, but they are a magnet for bees and especially butterflies as they waft gently in the breeze. They flower profusely, which makes them good for cut flower growers in summer. Bred form the cottage garden favourites, 'Scoop' are used mainly in the cut flower industry, as their tall strong stems reach almost 2ft, so they make quite an impact in a garden. They are half hardy, so will take down to just above 0C, once flowered, so grow in pots and give some protection. Supplied as a pack of 12 mixed colour plugs in sahdes of white, pink, berry puirple, red and lavender.